In 1591, Istanbul is as much a gateway between East and West as it is today. While the glorious city on the Bosporus is enjoying prosperous times under the rule of Sultan Murat III, the Frankish countries and especially Venice are undergoing a massive intellectual revolution known as the Renaissance. A surge of individualism, humanism and a general questioning of religious beliefs has Artists, Scientists and Philosophers take their trade to hitherto unknown levels of quality and expertise. The Miniaturists, illustrators at the service of the Sultan, in Pamuk’s novel “My name is Red” are well aware of what happens in the Art centres on the other side of the Mediterranean. Giotto’s discovery of linear perspective, the hyper-realism of the Northern Painters, the depiction of worldly themes and all the other developments are very tempting for these top class artists who crave to push their artistic skills to the limit. Unfortunately two major religious problems are prohibiting them to follow these new trends. Islam forbids pictures and portraits that cultivate sentiments of worship in people because it contributes to the polytheistic tendency and detracts them from the only true worship of Allah. Secondly, Artists cannot with their creative skills challenge the only true Creator. They have to stick to the way the ancients were painting and avoid having their own individual style. Alas, man is man, even if he is Sultan. And the Sultan has commissioned a “secret” book made in the Frankish way with 9 drawings and one realistic portrait of himself in the Venetian Style. But even a Sultan will not push his luck and the “secret book” is not for himself but intended as a present for the Doge of Venice to impress him of the wealth and power of the Ottoman empire. And this is where Pamuk’s story begins. In an Istanbul, made even more exotic by covering the city under a blanket of snow, a voice from the world of the death speaks to us. A Miniaturist, his faced bashed with a stone and thrown into a pit laments his murder by one of his colleagues, nay his friend, his brother. Like the biblical story of Joseph in the pit, the story begins with a tale of jealous fratricide. The most evident suspects are the other miniaturists who are co-working on the “secret book” of the Sultan. They are known by their nicknames: “Olive”, “Stork” and “Butterfly”. The dead man at the bottom of the pit is “Elegant”. The reader is now challenged to an exercise in (very) close reading of the multiple narrations in order to find out who of the Artists will betray himself by his style. Not an easy exercise and I challenge anyone to find the murderer before the last pages. Pamuk cleverly uses a system of multiple narrators who carry the story over the many, albeit short chapters to the elucidation of the mystery. There are quiet a lot of narrators but they introduce themselves to avoid confusion. Some of the narrators are living people, other are death, speaking from the netherworld, other are illustrations like the representation of a tree, a dog, a coin, a horse. Some double up, like the murderer, who speaks in two voices avoiding betraying himself and some meta-narrators, who tell the tale of another. Some people lie, some tell the truth. All cleverly done, connecting seamlessly into the flow of the main story. Although this multiple narrator approach give us an interesting kaleidoscopic view, one draw-back is that the reader has difficulty to empathize with one of the characters. There is a central love story between Black, the wannabe investigator and Shekure the woman he loves which brings these two protagonists to the front, but still their unclear “private agenda’s” make them too human to qualify them as heroes. Still, the whodunit is not the main topic of the book. “ My name is Red” is a novel of ideas investigating Art, the Artist, the Public and their relation to each other. The diametrically opposed views of East and West emphasize the different issues and shines new light on this vast philosophic topic. One of the major attractions of the book is that it brings a completely unknown world to the attention of the Western reader. The world of the miniaturists is vividly depicted in all it’s details. We are confronted with the moments of elation and despair of both the Masters and the apprentices. We commiserate in the harsh education of the younger ones, we beam with pride when the Sultan adore our illuminations. Pamuk brings this community to live into it’s finest details. But there is more. By naming the stories the miniaturist are illuminating, Pamuk opens a door of countless of unknown stories which are part of the oriental lore. This “mise –en –abime” confronts us with our poor knowledge of the basic myths and classical stories of the East. Who has heard of the “Book of the soul”, the history of tall Hasan, the love-story of Husrev and Shirin , the legend of the Blind-man’s horses and all these other stories who seem to lay at the heart of the Persian world ? It is this glimpse into another world that has given me the most satisfaction in reading Pamuk. An often-heard remark is that Pamuk’s “ My name is red” echoes Eco’s “In the name of the rose”. Not only do the titles resemble each other, although in a softer hue, but also the topic and it’s handling bring to mind Umberto Eco’s more than once. There is the murder mystery; there is the closed community of the miniaturists, the historical setting, the forbidden book, the different intellectual faction’s competing each other etc etc. I think it is too obvious to be mere accidental, but on the other hand it is clear too that Pamuk’s is in no need to copy someone else to show his talent. I guess that Pamuk has chosen the “ Whodunit” structure for the same reason as Eco: to pull the reader trough this difficult book by using his primeval curiosity. Remember E.M. Foster’s words: We are all like Scheherazade’s husband and we want to know “ what happens next?” This atavistic curiosity help’s us to finish “ My name is red” instead of forgetting it on our night table or bringing it back to the library half-read. Which would really be a shame. Maybe, and I Know that I am stretching the limits of interpretation, Pamuk plays a trick on the reader. Remember how the story is about the Eastern artist willing but not daring to copy the way of the Western masters? Well Pamuk dares, and he, Master of the East does his book in the Frankish way set before him by the Italian Master Umberto Eco. And where does that leave us, the scandalized conservative readers, shouting together “ this is not allowed”? If indeed, Pamuk has played a trick on us, I can well imagine him smiling while making his point. 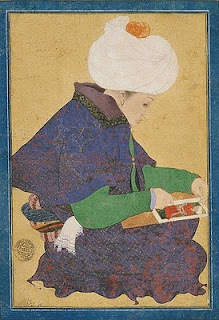 Portrait of a Painter, an Ottoman painting during the reign of Mehmet II (1444-1481 AD), housed in the Freer Gallery of Art, Smithsonian, Washington D.C.